Crete is the largest of the Greek islands. Its length from west to east is 250 kilometers and 37 kilometers from north to south. The huge size of the island allows any traveler to find there an ideal place to relax, while a well-developed road network makes it easy to get to them, especially if you travel with rentalcars24h.com car rental. Crete is famous for both popular tourist areas and calm, secluded mountain villages. Elafonisi is an incredibly beautiful virgin stretch of the Mediterranean coast, virtually untouched by infrastructural civilization. The natural uniqueness of this place is so great that in order to preserve the ecology, the building of hotels is prohibited there. Despite this fact, the beach is very popular among tourists – sun loungers and umbrellas, as well as parking are provided anyway. Travelers are attracted by the small depth of the sea, the opportunity to swim even in stormy weather and the enchanting beauty of the surrounding landscapes of the natural reserve. 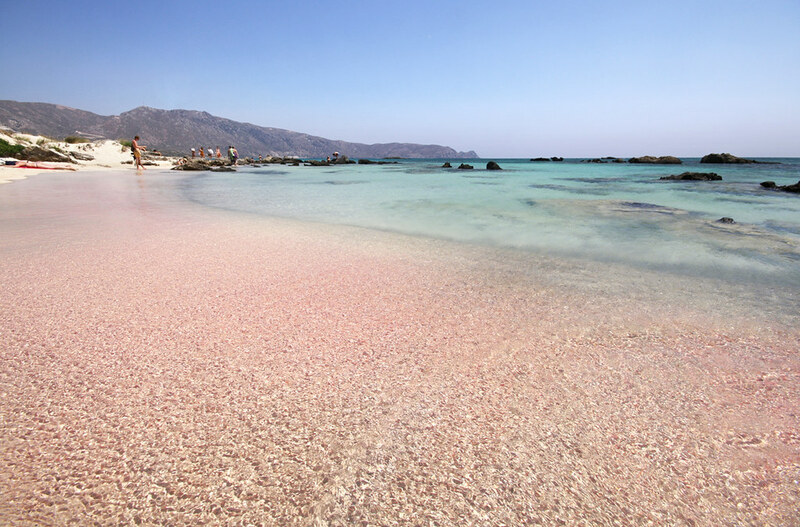 Travel guides often tell that Elafonisi is distinguished by unique pink sand. However, this is wrong. The sand itself is white, and a lot of small seashells give it the pink hue. In addition, Elafoinisi is also famous for the fact that the sea is very clean and shallow there. For this reason, the water in this place is always a few degrees warmer than in other parts of the island and allows you to swim even in the late autumn and sometimes in winter. 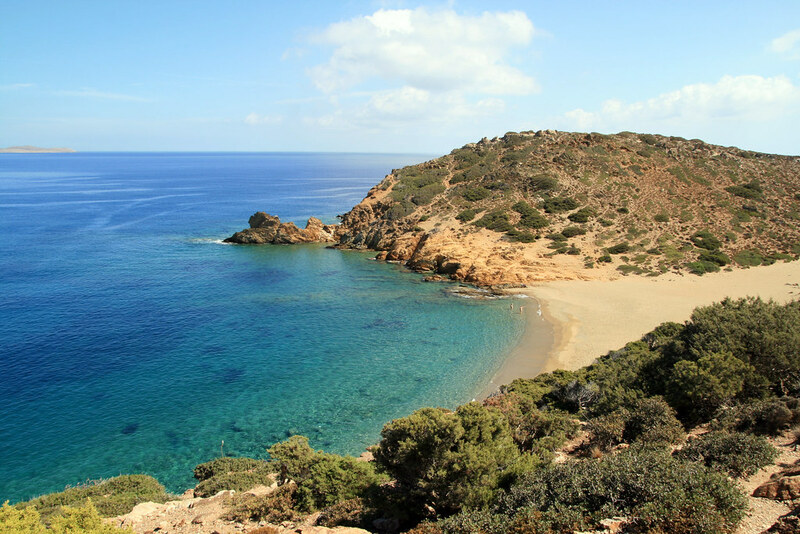 Included into the list of the cleanest beaches of Crete, Frangokastello is located next to a small village, where there’s everything necessary for the stay of tourists: hotels, taverns and shops. Near the beach you’ll see the main local sight – the ancient Venetian fortress, which gave the name to the beach and the village. The crystal purity of the warm Libyan Sea, golden sand, gently sloping shores, convenient entry into the water, and a flat sea bottom have won the hearts of beach fans. For the same reason, it’s especially suitable for the families with young children. There are almost no waves there except of August, when a strong wind blows for several days. Therefore, when going there, it makes sense to take a diving mask to admire the underwater beauty. The coastal strip is pretty well equipped. You can get to Frangokastello by bus from Chania, by taxi or a rental car. Vai Beach gained wide popularity due to the thousands of palm trees growing there. Therefore, it’s often called Palm Beach. Palm trees, which are so uncommon for the Greek islands, were brought there by Arab pirates in the 13th century. Azure sea, white sand, low caps of the surrounding mountains, and exotic crowns of date palms create a spectacular tropical landscape. Although Vai is placed a little away from the tourist routes, it’s very popular among beach travelers. There is a rental of deck chairs, parking, several taverns and cafes, which is everything you need to comfortably relax the whole day long. Time spent on the background of incredibly beautiful views will probably be the most romantic episode of a stay in Crete. Convenient entry into the sea, the opportunity to choose a place for sunbathing, a light breeze, and generous sun are excellent conditions for beach enjoyment. 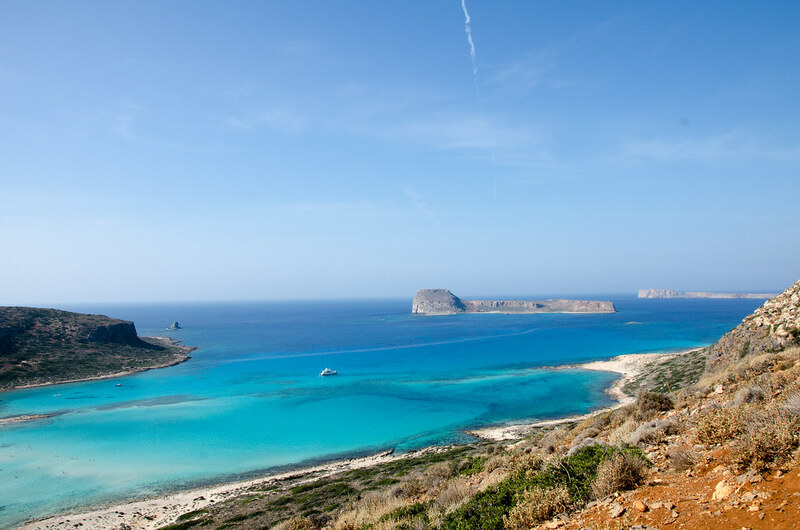 Balos is one of the most romantic and extraordinary beaches of Crete. This is a place where the waters of the 3 seas merge forming a kaleidoscope of blue shades on the water surface. Splashing around in a cozy bay with crystal water is an undoubted pleasure for children and adults. A walk on the pirate Gramvousa Island full of rabbits creates an indescribable feeling of wildness. This feeling is enhanced when you climb to the highest point of the island, where the ruins of an ancient Venetian fortress are located. In May, incredibly beautiful endemic plants bloom there, and in the summer the island becomes deserted. From the height there opens an amazing panorama of the colors of the sea water – from dark blue to pale turquoise hues. This spectacle fascinates with its magical and mysterious beauty. But it’s impossible to get to a unique beach by land-you can only reach it by boat. Hours spent in an amazing corner of the Mediterranean will be remembered for a lifetime! 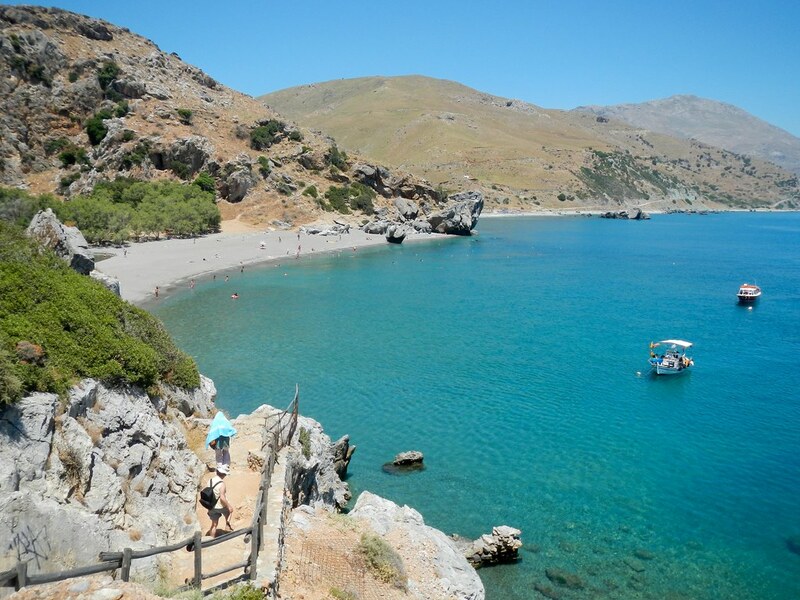 Those who like to relax against the backdrop of pristine virgin nature will definitely love Preveli Beach located 2 kilometers away from the ancient monastery. Sandy-pebble coastal strip is surrounded on one side by rocks with light forest, and on the other – by palm forest growing along the banks of Kurtaliotis River. Therefore, it’s well-protected from the winds. It’s always cozy and comfortable there, but you need to go down the stairs. There are no changing rooms, sun beds and umbrellas, but this drawback doesn’t spoil the charm of a truly unique place. While admiring amazing landscapes, you can spend wonderful minutes and hours of complete unity with the divine nature, enjoying the warm sea, velvet touches of sand, and feel the special atmosphere of Greece. After swimming in the salty sea you can splash in the fresh water of the river, relax in the shade of palm trees and come back with a baggage of pleasant impressions.